In my quest for dynamic and stimulating subject matter, I find myself in precarious positions. Sometimes it is on the edge of a cliff, trying to get a good panoramic scene, too close to the edge for my fear of heights and distrust in tall structures. I'm certain the ground will give way, or the rock will choose this minute to break off. I've waded through raging rivers that nearly took me for a dip, and I've gotten too close to wild animals (according to the Rangers). Standing still as animals charge toward you while looking at them through a camera lens is one of the most thrilling of my photo adventures. 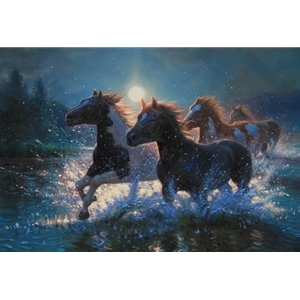 Sometimes the horses seem to be challenging me, tossing their heads, and looking at me as they run by just inches away. In Night Mares, I tried to capture the thrill of their thundering charge, the breathtaking closeness, and the moonlit drama which came to me the night after I photographed these beasts - realizing then - what I had been standing in front of.